Eskaton's Chaplain Patty builds friendship with residents and connects with them on a deep, personal level. She always goes above and beyond to meet the emotional and spiritual needs of each person. 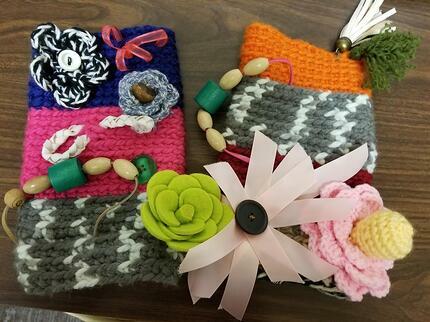 For example, she crocheted these muffs for residents living with dementia. 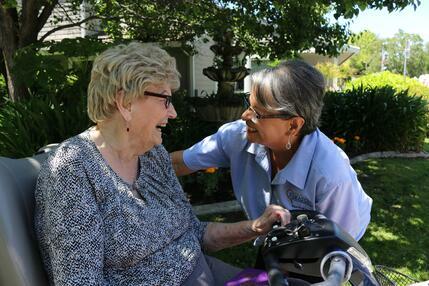 These muffs provide great sensory stimulation for residents who are fidgety and need something to hold and play with. Chaplain Patty also crochets animals for some of our residents. She is such an amazing woman and gifted chaplain. Thank you Patty! Eskaton's Spiritual Care Program aims to respect, support and enhance the spiritual and emotional life of Eskaton residents, participants, their families and staff. Ten trained chaplains offer the ministry of presence throughout Eskaton communities. With compassion they listen, provide acceptance, and give comfort and hope in the midst of variety of circumstances.